How are you all doing today? I hope you all survived through my very wordy post from Thursday. 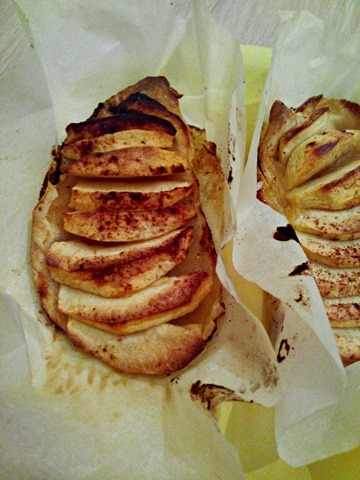 Today I want to share my recipe of the apple pie which is the simpliest recipe I will probably ever share ^^. But because some people requested it, and because we all love simple recipes I will satisfy this request. Before heading to the oh so simple and amazing recipe, let’s chat a bit about my random life. Today, it snowed on Paris. Ok , it lasted about 1 hour and nothing stayed on the ground but it made me happy like a 4 year old girl. And after that I randomly searched for races to run because after all, I said I would run at least 2 races this year. I really want to try a color run, because well, it’s just for fun. But i think it is maybe a little expensive? Plus, it’s not really a race but more of an experience, I think. Do some of you guys have already done a color run ? What did you think of it ? Is it worth it ? And the second race I am thinking of, is “ La Parisienne” it is a really huge race only for women held in Paris every year. But it is massive , there are like 35000 runners and I am thinking that this may be a little too much people for me. Anyway, I would love to find a race that is somewhere in between. Well organised, not too far from where I live, nice scenery and not too expensive. Maybe I am dreaming, aren’t I ? 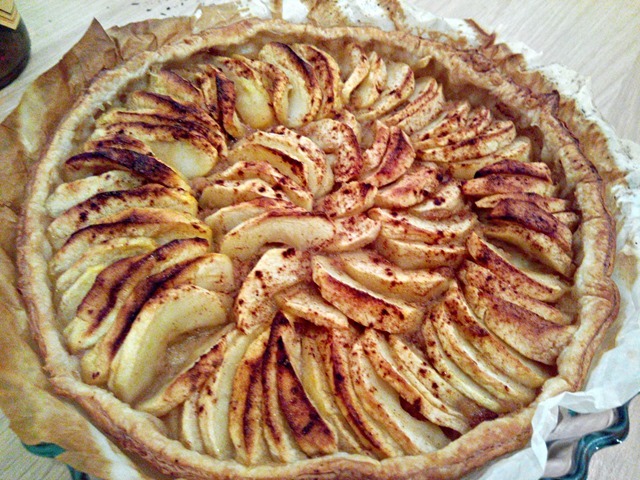 But now let’s get back to our beloved apple pie! 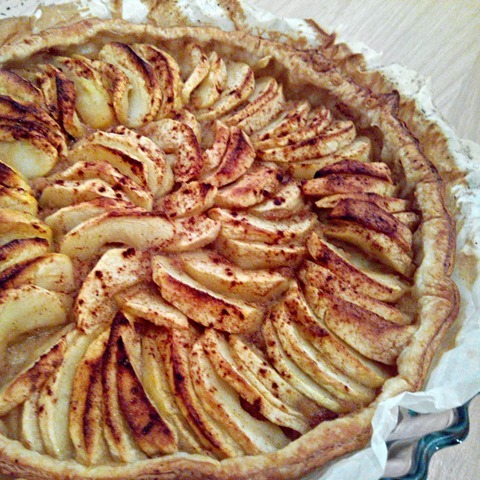 It’s a dessert that is made with very little preparation.and you can easily make a pie in less than 10 minutes. And you’ll only need 2 to 3 apples ! So if friends are coming over,this is a perfect recipe for an improptu tea time! ! 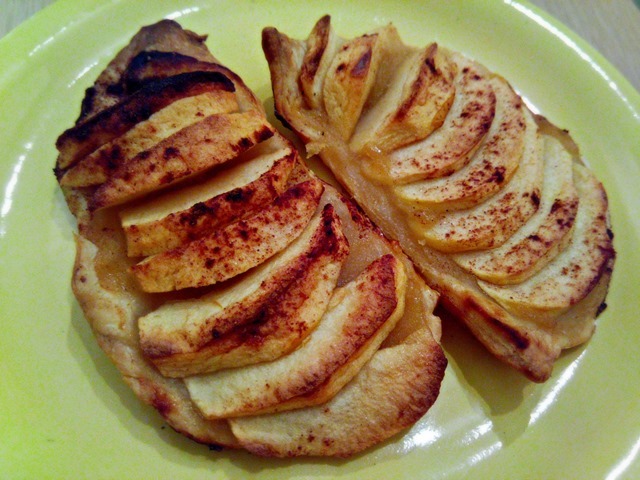 peel the apples and slice them in thin slices. Arrange the slices on the pie in a pinwheel shape. Be sure too arrange the slices very tightly. Bake for 30 minutes, or until the dough is golden brown. Enjoy ! Wow! That looks so good and I can’t believe how easy it is! 14 good things about 2014 – 15 better things about 2015!